BlueSeer is a free, open source Enterprise Resource Planning (ERP) software for small and medium-sized businesses operating in the warehousing, manufacturing, and transporting industries. It is an affordable solution that enables users to customize and maintain a reliable ERP system without the limitation of proprietary source codes. The platform offers generic features right out of the box with unprecedented customizability which makes it more cost efficient. Its open source availability, toolset, and design allow the large community of database and Java developers to support maintenance and implementations, and therefore stands as a realistic alternative to expensive proprietary implementation. 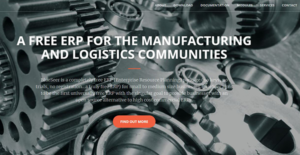 Some of its core features include MRP functionality, transport management, warehouse management, sales management, scheduling, accounting, production reporting, inventory management, and label generation. BlueSeer is a free, open source solution that is vastly more cost-efficient than the customary ERP application. It is an effective software that enables SMEs to achieve their business goals without the limitation of high-cost proprietary implementation and support. The multifaceted process of implementing an Enterprise Resource Planning software, even a free one can be intimidating, but that is not the case with BlueSeer. The solution offers a large pool of well-versed Java and DB developers to support its implementation, customization, and maintenance. It also provides implementation services for business looking to capitalize on this open source platform but lacks the capacity to effectively implement all the features it offers. In addition, companies can take advantage of the development services offered to users looking to customize or expand BlueSeer’s functionality to align with their business requirements and processes. Better still, BlueSeer is a highly customizable solution that can function more than just an ERP system thanks to its open source nature. The platform offers unprecedented customizability that gives it an added advantage of functioning as a peripheral custom program. This makes it cheaper, easier, and more practical to integrate a custom solution login within the structure of your ERP system to leverage its core functionality. The beauty of its customizability is that it permits you to build a solution that exemplifies all the vital requirements of an ERP system while providing a quick startup application kit to support your existing stack. Every organization has different wants and needs an application that can be personalized for their size, kind of workers and clients, and the specific industry they are in. For these reasons, no software can offer perfect tools out-of-the-box. When you search a software system, first be sure what you require it for. Read some BlueSeer reviews and ask yourself do you want basic functionality or do you need advanced functionality? Are there any industry-specific functionalities that you are searching for? Get the answers to these queries to assist your search. There are lots of aspects that you need to mull over and these include your finances, specific business wants, your organization size, integration needs etc. Take your time, use a few free trials, and finally select the system that presents all that you require to boost your company effectiveness and productivity. How Much Does BlueSeer Cost? BlueSeer is a completely free ERP software that publishes no enterprise pricing details. We realize that when you make a decision to buy ERP Software it’s important not only to see how experts evaluate it in their reviews, but also to find out if the real people and companies that buy it are actually satisfied with the product. That’s why we’ve created our behavior-based Customer Satisfaction Algorithm™ that gathers customer reviews, comments and BlueSeer reviews across a wide range of social media sites. The data is then presented in an easy to digest form showing how many people had positive and negative experience with BlueSeer. With that information at hand you should be equipped to make an informed buying decision that you won’t regret. What are BlueSeer pricing details? What integrations are available for BlueSeer? If you need more information about BlueSeer or you simply have a question let us know what you need and we’ll forward your request directly to the vendor.